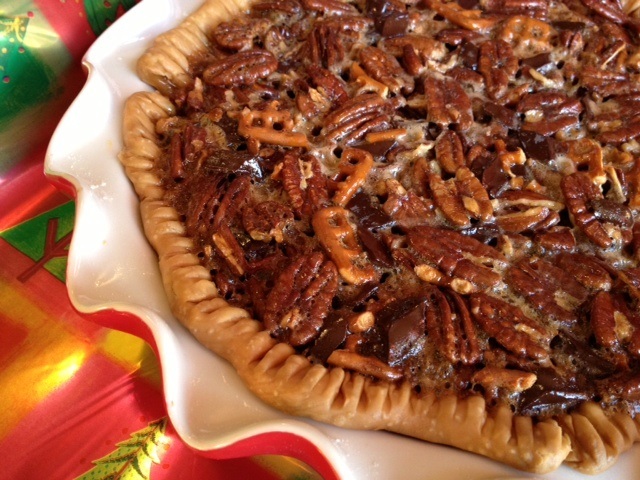 Here’s a pecan pie for those who don’t really love pecan pie. I love pecan pie but I couldn’t resist the idea of adding more good stuff to one of my favorites. Alex said he isn’t really a nut person – I beg to differ 😉 – but he really liked this pie. Tish liked it because she doesn’t like the texture of regular pecan pie. She also might be a bit of a chocoholic so that helped, I’m sure. When she was younger, maybe in junior high, I remember coming home from work and her telling me she had spent the day reading a book and eating the chocolate cookies she’d found in the kitchen. That’s my girl! I’d say this pie is definitely worth the try! It’s super easy to throw together, and you can use a pre-made pie crust if you don’t want to make it from scratch. I’m lazy. I used the refrigerated pie crust. The crust is not pre-baked and you should not prick the crust before loading it with the filling. One thing I didn’t do well, though – I didn’t rub enough flour on the pie crust before putting it into the pie pan. Shame on me for not following the directions on the box! If you’re making a pie with a high sugar content, such as pecan, you need to put flour on the pie crust to help absorb some of the sugar and prevent the filling from leaking through the crust. Mine leaked through the crust and the result was a pie that didn’t come out of the pan cleanly. Lesson learned! In a large bowl, whisk together the eggs, corn syrup, melted butter, vanilla, brown sugar, orange zest, cinnamon and salt. Stir in the pecans, pretzels and chocolate. Pour into the prepared pie crust. Bake for 30 minutes. Thanks for the flour on the crust tip! Know I know why I get soggy bottoms.